Escape Monthly - Vacation in a Box! - Subscription Box Mania! Escape Monthly - Vacation in a Box! I am extremely excited to say that I will be reviewing an Escape Monthly box this December! This month's destination is ITALY! 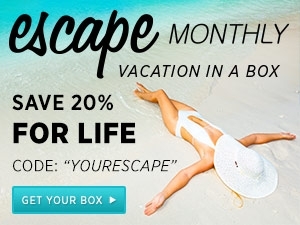 If you would like to try your own vacation in a box, click the link below and use the promo code "YOURESCAPE" to receive 20% off FOR LIFE!